The Union government has released a pollution index to help it decide where new industrial units are to be allowed and which areas need cleaning urgently. The index¤ developed in the past three months by cpcb and several Indian Institutes of Technology (iits)¤ earns admiration for the Union environment ministry and cpcb¤ but has rough edges which need smoothening. For one¤ the list of 88 most polluted areas announced on December 24 does not demarcate the boundaries of the areas. For example¤ the list names Ahmedabad¤ Aurangabad and Navi Mumbai as critically polluted. It is not clear whether it is the city¤ district or industrial areas in the district that are polluted. Considering the ministry is planning a moratorium on new industrial units in critically polluted areas¤ it is crucial to define the area. Two¤ several areas — such as Raigarh in Chhattisgarh¤ and Joda and Barbil in Orissa which are severely polluted by industrialization and mining — are missing from the list. Three¤ the poverty of pcb data used in the indices. 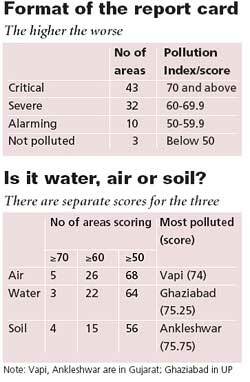 Though the air quality data is good¤ water and soil databases need improvement. The list is just a beginning; the ranking methodology will be improved¤ a cpcb official said¤ adding that demarcation of boundaries and pollution assessment will be studied in detail. Identification and ranking of industrial areas will be evaluated every two years. Under the new method industrial areas are ranked after taking into account the source¤ magnitude and scale of pollution; the number of people affected and pollution control measures. But research on the health of people near industrial areas is scarcely available. State pcbs do not have the capacity to continuously monitor pollutant levels let alone their health impact. An iit professor involved in drafting the methodology for the index admitted the government will have to boost its capacity to monitor pollution if the index is to work. “We need to look into regular health monitoring but for now the index will use reports from the media¤ research organizations¤ writ petitions and other governmental and non-governmental organizations besides the data available with state pcbs¤” he said. The ministry announced it will ask the Public Health Foundation of India¤ a research group in Delhi¤ to analyze and report on public health in the 88 areas. The new list replaces the list of 24 critically polluted areas¤ which¤ the government admits¤ was based on state pcbs’ observations and not on a scientific method. All 88 industrial areas belong to 17 categories of highly polluting industries and 54 red category industries—hazardous¤ noxious¤ heavy and large industries—proposed by cpcb. It is¤ however¤ not clear on what basis the ministry selected these areas. The ministry also announced creating a clean-up fund in the next budget¤ but did not clarify where the money will come from and whether the polluters would be asked to pay. As of now¤ the pollution index is in theory only. Untill it is notified under the Environment Protection Act¤ it cannnot be enforced.